Last time, we covered how rotation could keep our trees balanced. But how do we automatically apply our rotations? Last time we created two functions, rotateLeft and rotateRight, to do this rotation for us. So, OK, we can rotate our trees. That’s a nice first step! But we don’t want to have to rotate left or right manually, we just want insert to take care of it for us. So how do we get from here to there? AVL trees balance by making sure the height of each subtree is about the same. In our example from before, the balanced tree had a height of 2, while the unbalanced tree had a height of 5. 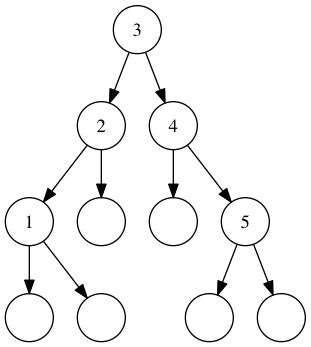 A balanced tree of 1 through 5 has a height of 2. An empty set has a height of 0. A singleton set has a height of 1. Anything else is the height of it’s tallest subtree, plus 1. When we insert, we’ll look at the new heights of the trees after insertion. If the difference between them is greater than 1 (so if the left is taller than the right, or the reverse), we’ll rotate! That’s all we need to do to set the stage! Now that we track of balance, we can rotate during insertion to keep the tree balanced. This takes less work that you might think! Remember that we measure the balance of a tree as the height of the right subtree minus the height of the left subtree. A tree is a valid AVL tree if the height is -1, 0, or 1. So, to make our trees valid AVL trees, we’ll rotate if the balance is outside that range. This means that if the tree leans to the right the value will be positive, and to the left the value will be negative. To balance our tree, we’ll first need to handle if the height difference is greater than one. Say we insert the letters A through C, in order. This is not a valid AVL tree, since the balance is 2 (a height of two on the right minus 0 on the left.) Since the tree is leaning right we’ll rotate left, so that B is at the root. Now the height of the left and the right subtrees is the same, so the difference is 0. This will make our tree valid again. An empty set is already balanced, so we return it immediately. Same for a set whose difference falls between the valid range of -1 and 1. Otherwise, we rotate! Notice that we’re only balancing the tree after insertion. This will make sure that each level of our tree is balanced from the bottom up, and only if any levels need it. This seems great so far, but there’s one more tree shape we need to consider. What if we inserted A, C, then B? The difference would be 2, but if we rotated right it would swap to -2! In this case, we need to rotate the tree at C right, then the tree at A left. The right rotation at C will create our unbalanced A-B-C set from above, then the left rotation at A will move B to the root, balancing the tree. If the tree were leaning the other way, we’d just reverse the operation. -- left leaning tree with right-leaning left subtree. -- right leaning tree with left-leaning right subtree. Whew, that function has quite a few conditionals! Generally, we’re examining the difference in each tree, and the difference in the relevant subtrees. If we find that the difference is 2 (or -2) and the difference in the subtree is -1 (or 1) we’ve hit our problem. We send the subtree to rotateLeft or rotateRight before rotating the whole tree in question. It looks sort of messy, but these 9 lines of code will maintain a valid AVL tree (and fast insert/lookup operations) in every situation. We’re done with balancing and insert! Now you can try this out for yourself. This is the same visualization from last time, but with balancing turned on. Insert values to see how the balancing code reacts and keeps everything tuned up. Insert three values in order. 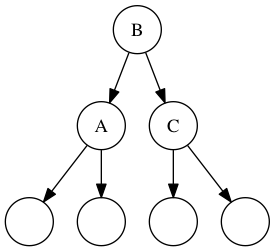 Insert three values so that you would get a leaning tree (like A C B.) Check out how the tree balances itself. Create some trees with the same values in different insertion order. 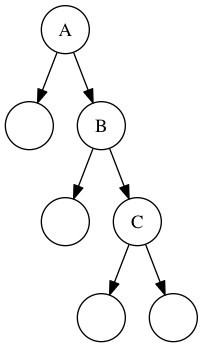 Notice how the composition of the tree will change with different insertion orders.